You head south, leaving behind the tedious miles of Yarmouth and Lowestoft suburbia, industrialisation and caravan parks. Or perhaps you are cycling the narrow lanes around delightfully remote Henstead and Benacre. Whichever, to reach this church you must travel for a while on the awful A12, the main road connecting London with the east coast. But shortly, you turn off down a narrow lane which, before fading out into the farmyard of Frostenden Hall, takes you past this little round-towered church on its mound. Apart from the Hall, there is no other building in sight, and the rolling fields and copses go some way to ameliorating the noise of the traffic on the road beyond. The tower sits contentedly, and this church is in no particular hurry about anything. You may find sheep grazing in the churchyard, or watch, as I did one autumn day in 2011, a tractor and plough cleaving a line away from me towards the top of the ridge, a rabble of seagulls wafting and diving behind it. I sat on the wall to watch because, unusually for this part of Suffolk, Frostenden church is kept locked, and I was waiting for the churchwarden. They open it every Saturday morning, but this was a Friday afternoon. There is no keyholder notice, but when I rang one of the churchwardens he was very happy to come and open up, even though it did mean him crossing the busy A12. 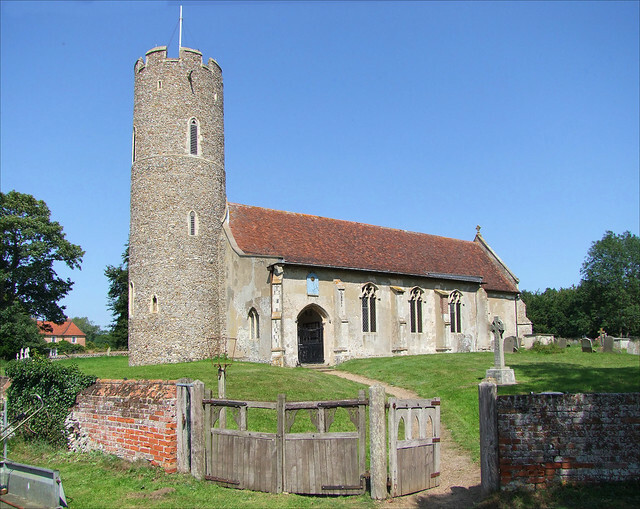 This is one of Suffolk's oldest round towers, probably early Norman but quite possibly Saxon, and the church against it, although much newer, is still mainly 13th century. A pretty sundial over the south door exhorts us in Latin to Watch and Pray. The porch forms the most westerly bay of the south aisle, and you step through it past an elaborate graffito reading 1606 into a simple, well-kept interior. I remembered liking this church a lot on my previous visit in 1998, though I didn't remember much about it. It's a quiet place, with nothing spectacular to impose itself. There is some very good early 20th century glass, and a fine Arts and Crafts memorial to a former Rector contemporary with it. A good earlier memorial to William Glover came just before the end of the Commonwealth. The Glovers must have been a locally significant family, as there are other memorials to them. The font appears to predate its Perpendicular cover by a century or so, and the cover itself is smaller around the base than you might expect. Perhaps it came from a different font originally, or, as Sam Mortlock thought, it is a cut down version of a towering font cover of the type found at Ufford and Hepworth. Turning east, I like the way the rood loft stairs turn back westwards from within the chancel. Best of all, I think I like the slightly uneven pamment floors. They lend an air of restraint to what is otherwise undeniably a 19th Century interior. Back out in the churchyard, there is a curiosity. The parish war memorial sits to the south of the porch. If you look at the names around the base, you will see that this parish lost more men in the Second World War than it did in the First. This is most unusual - you come across it in suburbs, where a city has grown to engulf what had been rural parishes, but not in remote spots like this. It seems impossible that Frostenden had a larger population during the second war than in the first, so I wonder what the story behind the discrepancy is? Beyond the churchyard wall, the ditch marks the route of the former river that served this village when it was an early medieval port. At Domesday, there were two churches here, and a thriving community. Now, only the sheep and the seagulls will keep you company.